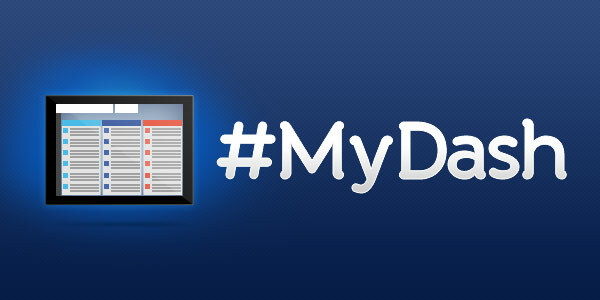 At the advent of 2013, we launched a blog series called #MyDash. Here, we highlight a HootSuite user, and get a glimpse at the way they’ve set up their dashboards to suit their unique social media needs. Follow the hashtag #MyDash and @HootWatch in Twitter to follow all the buzz or suggest someone for the next feature. Stay tuned as we begin to roll-out more unique ways to arrange your dash. In this #MyDash article, we spoke with Steve Rennie, the longtime manager of American rock band Incubus, and a major driving force behind the band’s multi-platinum commercial success. Rennie launched Renmanmb.com which is an online community space for musicians and music professionals trying to break into the industry to connect and learn. This gathering space is full of exclusive content and videos and is home to his weekly web show Renman MB Live where aspiring artists gain “insider access” to the music industry, directly from Rennie himself. Here, Rennie holds weekly discussions to aspiring artists from different musical genres, giving them his feedback on what they should and shouldn’t be doing along their journey to success. Tapping into Rennie’s 30+ years of music industry, guests on the show include anyone from personal contacts, producers and marketing executives, to signed and established bands. 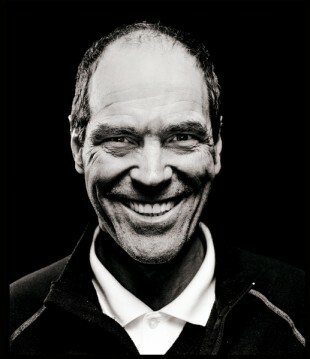 Renman’s “Dream it. Do it.” approach inspires artists across North America to smash through mediocrity and follow their dreams. As a HootSuite user, Rennie taps into comments and questions using the Twitter hashtag #RenmanLive and keywords on industry news and content during his live show and in community forums. Creating an online community for discussions, support, content and ideas is exactly what social media sets out to achieve. With the initial guidance of our Social Media Coaches, discover how Renman Management monitors communities of aspiring musicians, seeks new loyal followers to mentor and finds interesting industry content to discuss – all in social media. 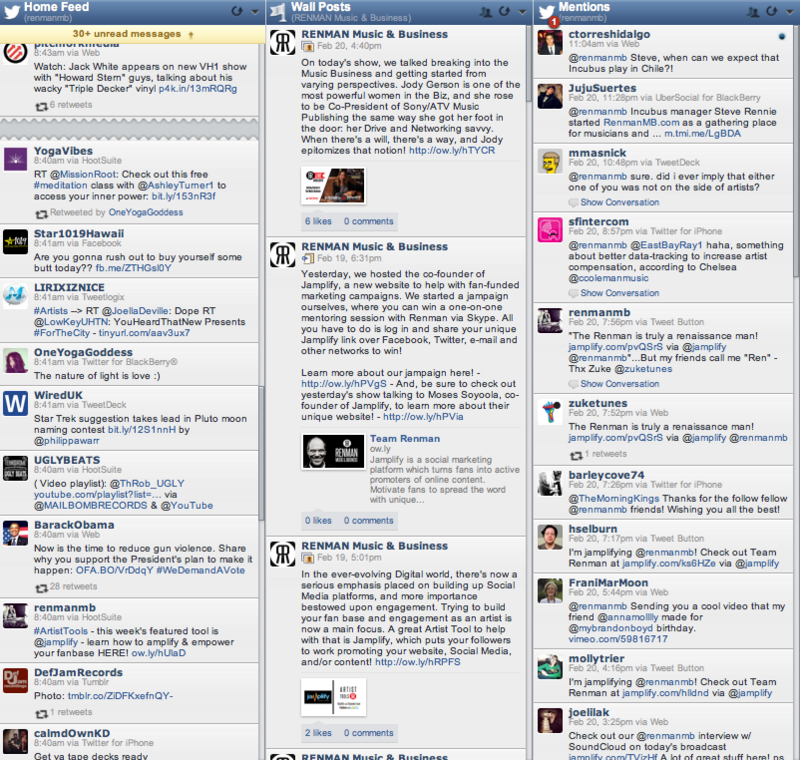 Could online discussions between artists, fans and management be the next generation of the music industry? Sam Milbrath, HootSuite: Renman Music and Business is an online community space for musicians and music professionals to connect and discuss music related news and ideas, correct? Steve Rennie: Correct! In this ever-changing music business, social is becoming more and more a part of standard practice. Using social helps make it easier to make a personal connection with our followers and fans… with that we are seeing growth in fan base because we are connecting personally and making it personal. In fact, “Making It Personal” is a mantra the show’s host lives/preaches by! SM: Do you find that your followers are connecting and discussing in both social and your website? Or what are your followers talking about in social? SR: They are very engaging on the social sites as well as the main web site. Usually when followers are talking on social, they are thanking us for the service, asking questions, submitting music or spreading the word about the show. 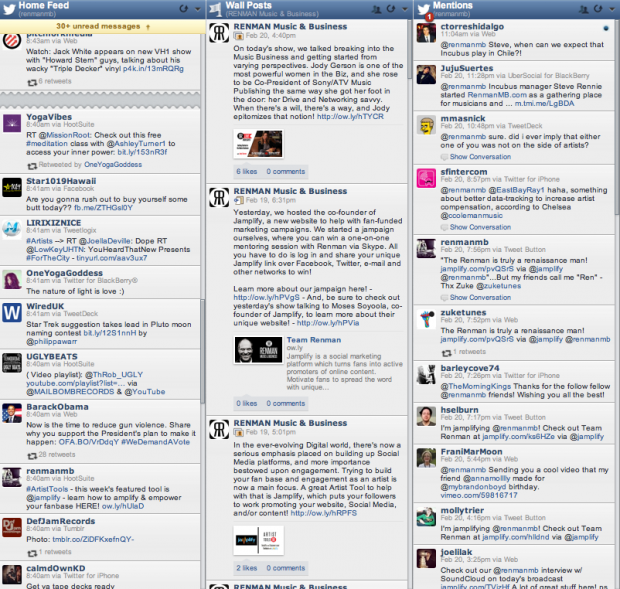 Notice that Renman uses their dashboard to monitor all of their social in one place. Having their Twitter Home Feed, Twitter Mentions and Facebook Wall Posts in one tab helps them keep a close eye on their brand’s image on their main social channels – with just one quick glance. Click to zoom in. SM: How have you set up HootSuite for Renman’s unique use of social media management? SR: HootSuite is a great way for us to organize and specifically filter through our social media sites based on our ever changing needs. The scheduling of tweets is extremely helpful with our workload. Being able to see everything we want to see all in one place is also huge. We’ve set up our HootSuite dashboard to monitor who is “talking about us” in Twitter, which is very helpful in identifying new and/or loyal fans! We’ve also set up a field to monitor the industry news in twitter feeds that we follow to keep us up to date on all the current trends. SM: What do you monitor in social? SR: We monitor our mentions, retweets, #RenmanLive, industry news, scheduled tweets and direct messages. 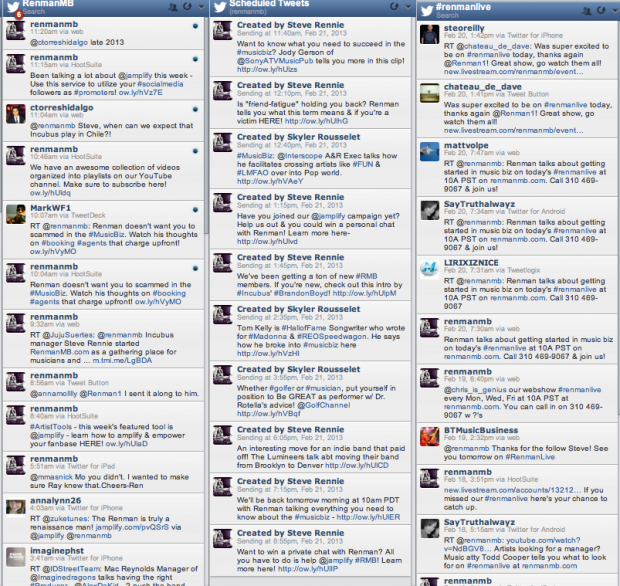 Notice how Renman is monitoring search streams, live stream hashtags and scheduled tweets. Not only does this ensure that they’re ever-present in social, but they also don’t miss a tweet by monitoring social on all fronts. Click to zoom-in. SM: Do questions or comments in your #RenmanLive Twitter stream ever affect your live stream discussions? SR: This is actually a new tactic we just started, so we haven’t really done anything yet with it, except monitor it. Down the road, we plan on answering the questions on the broadcast! SM: Good idea! What about in the field you’ve set up to monitor industry news – do you ever get ideas from there for discussions or articles? SR: All the time! It also gives us a great springboard for discussion during the live broadcast. SM: This seems like quite the production, how many people run your social media networks? SR: There are 4 people that run our accounts and we maintain similar voice so it seems as though the web show host is tweeting (and he usually is), himself. SM: Do members of your social team all have different roles or tasks to monitor? Or how are you ensuring that their social messaging aren’t overlapping? SR: In order to ensure that no one is overlapping their messages, we use the scheduling messages function (with limited permissions) and that way we can see when who has posted what, when. Thanks Ren Management for participating in #MyDash! Back in January of this year, our very own VP Community, Dave Olson spoke to Steve Rennie about how social media can help artists, brands and managers, both new and established, connect with fans and drive traffic to their music. Our Social Media Coach program helped Renman set up their social media management and campaigns. This free program has the goal of helping educate people on how to best utilize HootSuite to accomplish their social media goals. Do you need a hand to get fast-tracked onto HootSuite Pro? Contact @HootSuite_Pro in Twitter for more information!